Every pregnant woman wants a healthy child and every mother-to-be can help make this a reality by not smoking. Hundreds of thousands of deaths each year are smoking related. Most everyone is aware of how unhealthy it is to smoke. However, you may not have been aware of the effects smoking has on unborn children. This is because if a pregnant woman smokes… so does her unborn baby. Such problems can threaten the health… and life of the baby and mother. If you’re pregnant, don’t smoke and if you’re considering becoming pregnant you should look into kicking the habit. Did you know that your baby is not protected from cigarette smoke while inside the mother’s womb? The placenta is a complex organ that connects the mother and baby. It allows nutrients and oxygen to pass from the mother to the unborn baby. It also allows the baby to get rid of wastes. Furthermore, it keeps some harmful substances from reaching the baby. However, some harmful substances can cross the placenta and enter the baby’s bloodstream. Once there, they can affect the baby’s growth. Carbon Monoxide is a toxic gas found in cigarette smoke that lowers the oxygen levels in the mother’s blood. This causes less oxygen for the baby too. Nicotine is the addictive drug in tobacco. It causes blood vessels to narrow which reduces blood flow. You can protect your baby from these dangers by not smoking! Low birth weight is a leading cause of death in infants. (7) Premature delivery is another risk. Babies born before they’re fully developed may have problems breathing, digesting food, and staying warm… some die. This can put the lives of both the mother and child in danger. Sudden Infant Death Syndrome (SIDS), also known as crib death, occurs more often in babies of women who smoked during pregnancy. Preventing such tragedies is simple: If you don’t smoke, don’t start. People start smoking for many reasons. Most smokers begin smoking in their teenage years. They may start because their friends smoke, their family members smoke, or advertisements make it seem like smoking is glamorous and the “in thing” to do. There really are no good reasons to smoke. Always remember that it is a lot more difficult to stop smoking than it is not to start at all. And if you start, I guarantee you will wish you hadn’t. It is also important to avoid alcohol and other drugs too. If you are pregnant and you do smoke, quit, not just for your health, but for your baby’s health too. Stop smoking now to reduce the health risks to your baby; you also improve your odds for a longer life. Stay away from second-hand smoke too. The harmful chemicals from another person’s cigarette smoke can reach your unborn baby; try to avoid places which people smoke. Millions of people have already quit smoking and you can do it too, here are a few tips to help you out. √ First, set a day to quit, pick a specific date and mark it on your calendar, tell your family and friends and try to plan a day full of activities that aren’t associated with smoking. √ Stay positive, if you start smoking again, don’t give up. It doesn’t mean you have failed, only that you have not succeeded yet. √ You’ll also want to find alternative ways to help you relax during stressful times. Be sure to look toward others for support. √ Ask a loved one or a friend to quit with you. Also, ask friends and family not to smoke around you. √ It helps to always keep your hands busy, so it may be beneficial to start a hobby or work on projects. 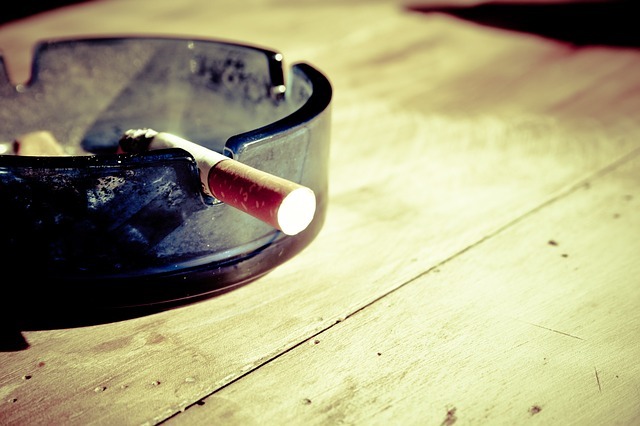 Avoid triggers and reminders of smoking by throwing away cigarettes, ashtrays, and lighters. √ If possible, avoid places and activities that remind you of smoking. To maintain a healthy weight while quitting, keep low-calorie snacks handy and raw vegetables, fruit, popcorn, etc., to help curb your smoking and weight. √ Drinking lots of water helps flush nicotine out of your system. Avoid coffee, colas, and other caffeinated beverages — it can harm your baby. By quitting, in a few months, you will be breathing easier and enjoying the benefits of not smoking. Make quitting smoking part of a total health program. Eat a balanced, healthy diet by choosing a variety of fruits, vegetables and whole grains. Limit saturated fats, trans fats, cholesterol, sodium, and sugar. Make lean, low-fat or non-fat choices when possible. Make sure to get plenty of vitamins and minerals. Also, talk to your health-care provider and get regular check-ups. Unless you are having complications, physical activity is generally recommended. Get 30 minutes daily of moderate exercise, but be sure to avoid any activities where the risk of hurting your belly or falling is high. The earlier you quit the better your baby’s chances of being born healthy. Even if you are more than 4 months pregnant, quitting can help your baby.